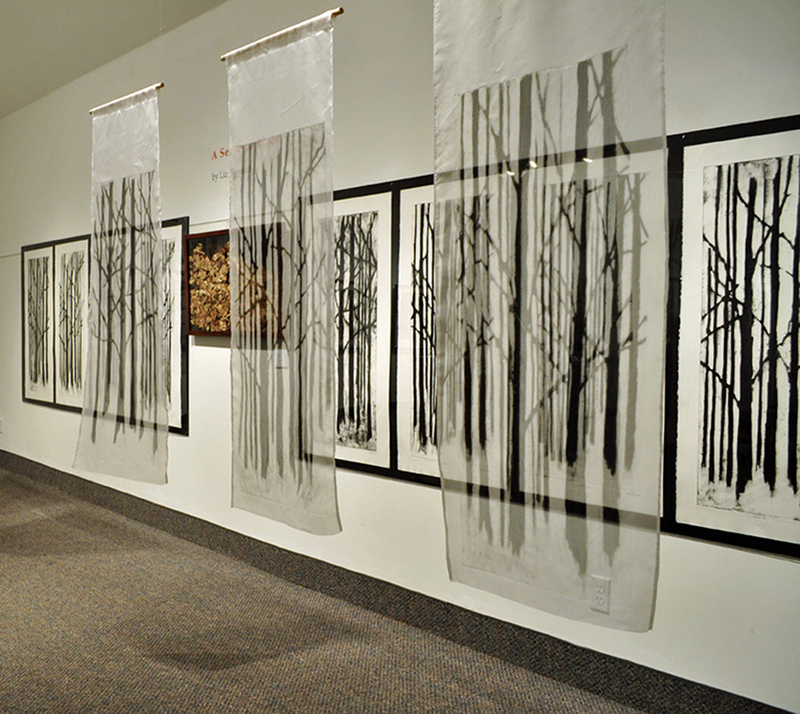 Liz Menard, Forest I, II and III, 2013, collagraph on silk organza panels, 18” x 51” (each panel) and collagraph on paper 18" x 44" (each); and Leaves, 2013, hand-tinted washi (variable dimensions). Paper is a common print surface in printmaking, but many contemporary print media artists are exploring alternative print surfaces. Beyond Paper is a group exhibition that presents work which utilizes alternative print substrates such as ceramic, fabric and wood rather than solely paper. Work by Laura Bydlowska, Pam Lobb, Liz Menard and Theresa Morin examines the fragile existence of nature. Each artist emphasizes such fragility by working with non-traditional surfaces for their print-based work.